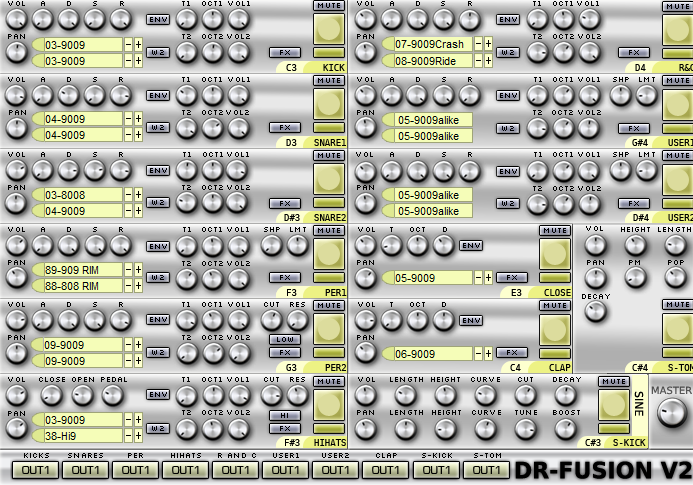 Dr Fusion 2 is a free vst drum sampler and synth developed by theodosynthsarchive. This free vst drum sampler has a complete setting panels that you can operate to meet the perfectness of drum sounds in your digital music making project. There is nothing fancy about the interface but a complete sets of parameters and knobs for you to experiment finding new drum sounds as this drum vst is to develop drum sampler of your own. Dr Fusion 2 is like the other drum synth as it is embeddable in many DAWs such as fl studio, studioone, cubase, nuendo, and you can try with the other DAWs of your preference. Oberserve the following features of Dr Fusion 2. With those above parameters, you will certainly have great chance to creatively build your own drum sounds because sometimes, as a professional and curious digital music maker, you may want to have unique drum sounds than the others. Sometimes, other ready to use drum samples just don’t suite your taste and style of drum sounds. Download Dr Fusion 2 as your music project supplement or just as your collection of free vsts that you use or need someday.